I've been trying to use my telephoto lens along Main Street more recently, because you really need the long lens to capture all the great projections and space carving that the Main Street facades perform. Wide open, the street just appears in front of you, and those pesky guests get in the way. But zoomed in? Well, then you can focus on the texture and fabric of the street and hone in on some nice details. 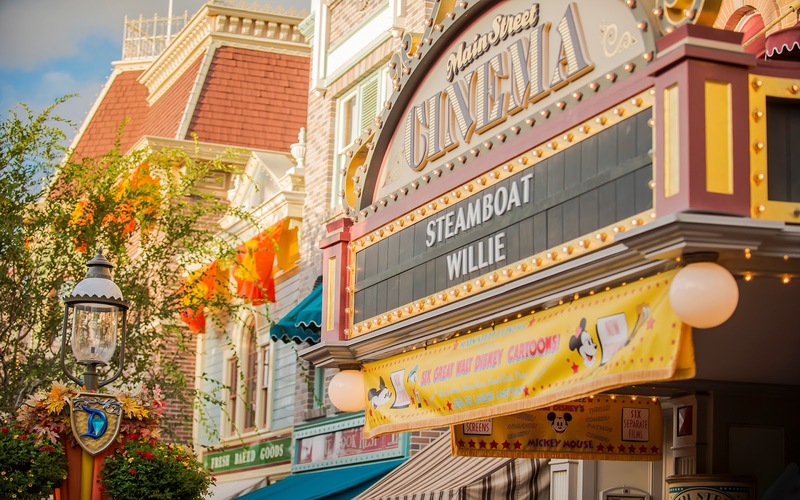 The Main Street Cinema doesn't show any Halloween themed films during Halloween Time, and that's probably better, anyway, since horror movies would be detrimental to the Disney experience (watching A Nightmare Before Christmas or Hocus Pocus would be immensely fun, though!). But it's got a charming presence and Americana nostalgia that fit well with the family vibe of autumn. There's just enough of history to make it a bit spooky in a fun way. Halloween Time and golden hour meet at the Main Street Cinema.